Calgon Carbon's products are key performers in many manufacturing and industrial processes that demand the most effective purification, separation or concentration of our customers' products. In addition to industrial potable water and water reuse, Calgon Carbon provides products, services, and equipment for a wide range of chemical and industrial processes. Within the gas industries – including natural gas and other high purity gases – refineries depend on our activated carbons to remove contamination. The liquefied natural gas industry uses our activated carbon products to remove mercury compounds that would otherwise corrode process equipment. 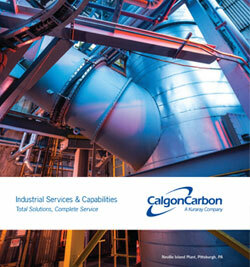 Calgon Carbon’s activated carbons are also widely used in gasoline vapor recovery equipment. Calgon Carbon also provides activated carbon products and services that can effectively decolorize and purify certain chemicals, such as hydrochloric acid, and provide catalysis for reaction stages We pride ourselves in developing effective and innovative solutions for your industrial and commercial manufacturing processes. Remove a wide range of trace impurities from chemicals and solvents during their manufacturing process. Products developed for catalytic processes and protection as well as carriers for catalytic metals . Use in gasoline-vapor recovery equipment and to remove contaminants and capture mercury compounds. Create a source of clean, contaminant free process water for industrial manufacturing. Contaminant removal in water with stringent purity requirements. Attain purity requirements for chemicals created with renewable feedstocks.